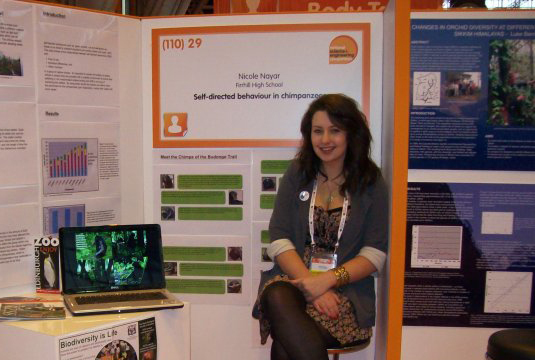 Nicole Nayar was in 5th year at Firrhill High School in Edinburgh when given the opportunity to apply for a Nuffield Project. Nicole is currently in her third year at Heriot-Watt University in Edinburgh, studying Biological Sciences. “In the future I hope to do well in my current degree and go on to an MSc program. Following advice, I have been looking into another placement for the summer of 2013 and due to the people I met during my Nuffield placement I may be back at the RZSS working with other primates. I hope that this previous experience will give me an extra something when it comes to Masters’ applications." "The Nuffield Placement has opened many doors for me, including entering my project for a British Science Association Gold CREST award, being judged at the Royal College of Physicians in Edinburgh and awarded a place at the National Science and Engineering Competition in Manchester in 2010."